Just like many others in Kharkiv, Ukraine, scene Thunderkraft make it a point to express their national pride through their music and lyrics. I'll leave it to bandmembers' conscience as to how non-political the self-proclamation really is. The logo featuring a bit of an Iron Cross, releasing earlier on the Blazing Productions alongside some openly NS acts, and the mainman Master Alafern association with Svyatogor and Dub Buk (in live setting) - I just felt the need to state some facts, but nothing in the Ukrainian-Russian sung lyrics on Totentanz suggests a purely nationialistic orientation. Moreover, I did enjoy rebellious screams of "I see my victory" and "I see my freedom" screamed atop of the lungs in their (an mine) native Ukrainian. 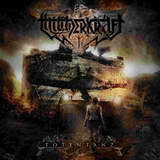 A lot of screaming, almost 'core, vocals is not the only thing that sets Thuderkraft apart from many other Kharkiv bands. Not going for the usual fuzzily produced, overtly melodic, tremolo-ridden black metal, Thunderkraft instead root their approach in tightly organized, groovy, almost militaristic or industrialized, death metal, which has a bit of the old Swedish (Nihilist, Unleashed), but also brings to mind Moonspell due to those industrial slamming rhythms (Mass Defect). Yet, beginning with the strong opening salvo of Настане час [A Time Will Come] Thuderkraft at times provide those folky longing sing-along Ukrainian melodies I remember growing up with. Those motifs are often provided in the form of keyboard arrangements, and do contrast mightily with the guitars mostly concentrating on chugging, slamming and grooving, occasional nerve-jiggling solo notwithstanding (Світ майбутнього [The Future World]). In fact, if anything I wish there would be more those outright Ukranian flavored moments as the intro on Навстречу новой заре [Towards A New Dawn]. Thunderkraft rarely go into the gothic, reserved mode, and even if they do (the layered Draconian-like beginning of Смерть не роз'єднає нас [Death Won't Separate Us]), the music almost always progresses from there. Thunderkraft are true masters of build-up and drama, sometimes going even a bit overboard when cleaner shouts take over in Смерть не роз'єднає нас [Death Won't Separate Us] and Творець життя [The Creator Of Life]. In fact, as I mentioned earlier, screams and shouts on Totentanz are quite ubiquitous, and may be a negative for those who cling to vocal purity of death grunts and growls in death metal. In their sum total then, some songs on Totentanz project apocalypse and the sense of mass hysteria, not only the Ukrainian roots of the band. Adding to it Thunderkraft are keen on employing a healthy amount of experimentation in their music providing multiple samples throughout, metallic clangs and loops on Де сон л'є вологою з вій [Where The Dream Flows As Moisture From Eyelashes] and outright atmosphere of the rave bar on the title track. Still, my most favorite arrangements were those of the dear-to-my-heart Ukrainian origin or the ominous eerie penetrations in Mass defect and Totentanz. Not the album which completely blew my mind, Totentanz has enough in it to keep you interested and guessing where the band is going to go next. The album is definitely not a copycat of something existing to date, and pulls enough from multiple genres to start carving a niche of its own. At the same time, those hysteria-filled 'corish vocals may be taking it out a touch too far for the more mainstream death/black metal fans to completely embrace it.